Fifty-nine year-old tennis pro, Wally Wilson just wants his life easy. A U.S. Open champion who’s been banned from the tour because of age, he’s back teaching on a private court in the Silicon Valley burbs. No more facing down tall teens with big forehands, or his own creaky back. Instead, his days are spent telling venture lions and tech stars to watch the ball, bend their knees, and shut off their phones. But when the family mini-van flatlines on a college visit road trip, and his agent promises ready cash for a two-day exhibition, he’s thrown neck-deep into a world of score-fixing, art forging, juiced octogenarians, and a coffee table book of naked pictures of his wife. Agreeing to one last money match seemed like a good idea. Wally never imagined it would cost him his chill. And make him cancel so many lessons. MARCUS PAUL COOTSONA is a tennis professional, lapsed playwright and the author of OCCAM'S RACQUET and the tennis novel, SLAMMIN'. He is also a contributor to Inside Tennis magazine. He lives in Northern California with his wife and a sublime, ridiculous dog. He is not a former Navy SEAL. Rubber Match, an unusual tennis story in e-book by Marcus Paul Cootsona. Plot: the reader is introduced to Wally Woodrow Wilson a 59-year-old tennis professional with his most attractive wife Danielle who are visiting colleges with their high school senior son Deuce who is quite adept at various form of magic and would prefer to try his hand in Las Vegas. They are accompanied by their red merle Australian Shepard, Rod Laver, the dog. They also have a daughter Addie who is in college and has a best friend, Ashley Margincall. Ashley is the daughter of an immensely rich parent who gives her huge amounts of money which apparently she employs in a highly successful entrepreneurial manner. From this point the story takes off to provide a tale of a stolen Dutch masterpiece painting, search for which involves Wally, his family and a host of other amusingly unconventional characters in a rambling story most prominently involving a remake of the format of the Davis Cup Tennis Tournament. Discussion: The author is a highly regarded tennis professional and “lapsed playwright” with two other books and routine contributions to Tennis Magazine to his credit. His story here is an amusingly presented parody of tennis - and more specifically of the Davis Cup Format. Here he references the changing mentality of modern society. Tennis was begun in another era when life moved at a more leisurely pace. Today the average attention span of any millennial, the fastest growing group of consumers, has been found to be EIGHT SECONDS. Thus sports are increasingly being criticized for time consumed. Golf is ridiculous; 3 hours of football includes actual playing time of 11 minutes; baseball, 18 minutes; tennis time wise, probably is the best at 31 minutes of activity in 3 hours. An interesting example the author provides is the fact that Nadal takes as much as 45 seconds between shots compared with a match in 1969 between John Newcome (deceased Australia) and Rod Laver where time between shots routinely was clocked at 6 seconds. With respect to the flow of the story, it does so nicely except for some slightly annoying proofing errors more prominent in the later pages. Of particular interest and fascination to this reader was the author’s inclusion in this zany story of a deeper conviction: “96 % of the universe is dark matter. Nobody has seen it. Nobody may ever know how it works. That’s you.” You are controlled by destiny. “So, you can’t sit back and ask destiny to do its worst. Because it will. And nothing will happen. At least nothing good. You have to participate. With faith. And with goodwill. And without expectation. The way to be in control is to make a decision. Even if it seems risky.” A most thoughtful suggestion. 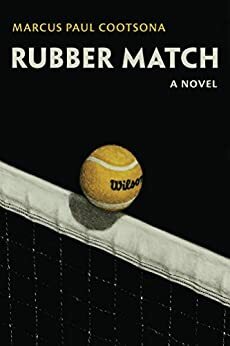 California author Marcus Paul Cootsona has three novels to his credit thus far – OCCAM’S RACQUET: 12 SIMPLE STEPS TO SMARTER TENNIS, SLAMMIN’ and now RUBBER MATCH. It is no surprise he is a tennis teaching professional. He also is a member of the Wilson Advisory Staff and has been three times named "Tennis Specialty Retailer of the Year". That he also happens to possess a polished sense of humor is evident from his previous books as well as the opening of his current novel. Marcus’s bio states he is a lapsed playwright a fact that some how helps us jump into the style of razor sharp, richly atmospheric and intelligent prose that fills every page of this book. For example, try this opening page – ‘Three clotted freeways and one toney toll road in the rear view, Wally Wilson and his wife Danielle were about an hour out of la heading south on i-5 at or near the posted on a hot August day. Their 2003 Honda Odyssey ex minivan with onboard navigation and a hundred and sixty grand on the meter was paddling along like a salt-whipped sloop, determined to stay afloat purely out of age and stubbornness. Seventeen year-old Deuce Wilson shared the backseat with their red merle Australian Shepard, Rod Laver the Dog, and was palming, finger-rolling, and vanishing Susan B’s. A lone playing card floated benignly in the air to his right. Deuce had been quiet since Bixby Knolls, but teenage wheels were turning. Just past the San Onofre nuclear plant he spoke. “Why can’t I be an autodidact?” he asked, in his almost-Joseph- Gordon-Levitt voice. The JGL, incidentally, from ‘Looper’ not ‘Brick’. “An auto-deduct?” said Wally. “An autodidact,” he said. “A self-taught person.” Family interaction, contemporary conversation topics, and a keen play on words are such a welcome treat in a novel we expect to be just another tennis novel! It is easy to think of the novel rubber Match as a journey into the improbable. It centers on a former tennis pro and US Open winner, Wally Wilson, now a teaching pro, who surprisingly gets the call to represent the USA in the Davis Cup. Unfortunately for Wally, with 60 gaining on him fast, he feels past his prime, but a convergence of circumstances makes it difficult for him to refuse. The story starts with the most mundane of settings, with Wally, his wife Danielle and their son Deuce taking a trip to look at colleges. The battle of wills that ensues offers the first glimpse of the humor that Cootsona so effectively infuses into the story. Chock full of cultural references and brimming with engaging dialogue, Rubber Match is a story that you are not likely to forget. The author uses many familiar names from the world of tennis, but it is the other characters who propel the story. With Wally and his family caught up in a mystery, you will see that there is more at stake than just the biggest tennis match of his life. This could easily have gotten a 4.5 stars if I knew how to give that rating.